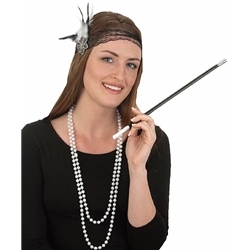 Includes flapper headband, plastic prop cigarette holder, and faux pearl flapper beads. The flapper costume accessory kit include almost everything that you need to complete the look of your flapper costume. Pair this costume kit up with any flapper dress for a quick and easy flapper Halloween costume.